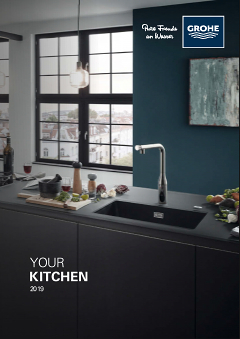 GROHE Concetto kitchen tap – with pull-down spray head for maximum operating area! A perfect blend of minimalist design and maximum functionality! This GROHE Concetto kitchen mixer has a straight medium high spout that swivels smoothly through 100° for a flexible operating radius while preventing it from bumping into any surrounding cupboards or walls. It also has a pull-down spray head so cleaning and filling even the largest pans is quick and easy. Engineered with GROHE SilkMove technology, it has a ceramic cartridge that ensures a precise and effortless control of water temperature and flow. With its clean, elegant lines and gleaming GROHE StarLight chrome, which is easy to clean and retains its pristine look even after years of use, it will make a stunning addition to your kitchen. Thanks to our easy installation system, you'll have it fitted in no time! More flexibility in your kitchen: the pull-out spray head offers you a bigger operating radius, letting you fill pots, wash vegetables or rinse off dishes easily, and reaching into all corners of your basin. This spout turns smoothly within a 100° radius, giving you full operating control without it hitting any surrounding cupboards or walls. Functional performance and purity of design.